La Païva is the sixth of eight patterns in the Courtesans shawl collection. Available as part of the collection (e-book) or as an individual pattern. Further information can be found here. Ruthlessly ambitious, Thérèse Lachmann, a.k.a. Madame Villoing, later Madame la Marquise de Païva, finally Countess Henkel von Donnersmark, is perhaps the most notorious of all the Parisian demi-monde. In one memoir, she is described as entering a freezing cold room, bare-armed and dripping with jewels – some kind of mythological monster from the freezing north. 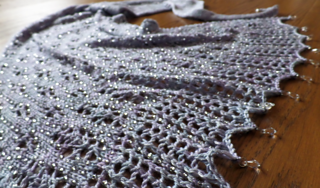 La Païva is a triangular shawl with increasing lace pattern and optional beads, worked sideways. For reference: The beaded sample uses jump rings to attach the drop crystals due to the small hole sizes in these drop crystals. Alternatively, embroidery thread and a fine needle could be used to attach the drop crystals. Beaded sample shown in Old Maiden Aunt Merino / Silk 4 Ply in the ‘Cold Sheep’ colour way, with silver-lined transparent Miyuki beads and transparent Swarovski crystal pendants. Unbeaded sample shown in Ginger’s Hand Dyed Bleating Velvet 4 Ply in the ‘Dove’ colour way.